A recent paper published by the Lancet demonstrating the global impact of alcohol consumption was a huge exercise from the Gates Foundation-funded Institute for Health Metrics and Evaluation (IHME) in Seattle. They built a large and complex statistical model from a vast range of data sources, and conclude that while moderate alcohol consumption may be preventive for some conditions such as ischaemic heart disease and diabetes, when combined with increasing risk of cancers and other outcomes there is a steadily increasing harm from alcohol consumption, as shown in Figure 5 from the paper reproduced below. This leads them to argue that there is ‘no safe level’ of alcohol. The relative risk curve for alcohol-related health problems estimated . A standard drink s 10g of alcohol, which is 1.25 UK units [Added 27th August. 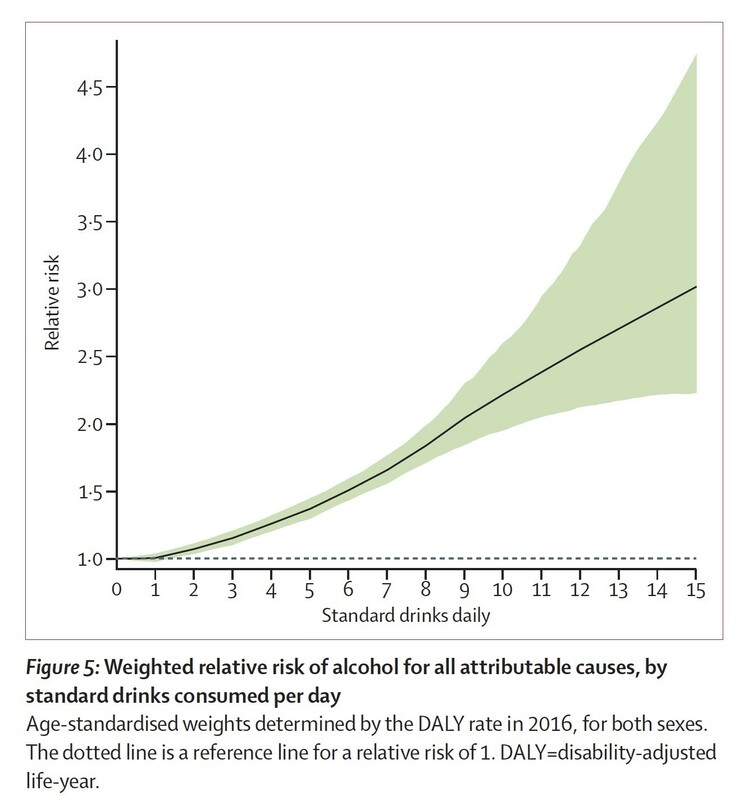 Note the uncertainty interval does not start to exclude ‘no effect’ until over 1 drink a day]. the paper did not report any absolute risks, meaning that readers couldn’t tell how dangerous drinking alcohol really was for them. Fortunately this extraordinarily lax review process was countered by the Lancet press office who asked for absolute risk estimates from the authors. This is truly excellent practice for which the press office deserve sincere congratulations. Especially as they also headed the press release with “Peer-reviewed / Observational study / People”, an example of the new Science Media Centre/Academy of Medical Sciences guidelines for headlining press releases. So the information is now all there, but what does it actually mean for moderate drinkers? Let’s consider one drink a day (10g, 1.25 UK units) compared to none, for which the authors estimated an extra 4 (918–914) in 100,000 people would experience a (serious) alcohol-related condition. That means, to experience one extra problem, 25,000 people need to drink 10g alcohol a day for a year, that’s 3,650g a year each. To put this in perspective, a standard 70cl bottle of gin contains 224 g of alcohol, so 3,650g a year is equivalent to around 16 bottles of gin per person. That’s a total of 400,000 bottles of gin among 25,000 people, being associated with one extra health problem. Which indicates a rather low level of harm in these occasional drinkers. Next look at 2 drinks a day, that’s 20g, or 2.5 units, slightly above the current UK guidelines of 14 units a week for both men and women. In this case, compared to non-drinkers an extra 63 (977–914) in 100,000 people experience a health problem each year. That means, to experience one extra problem, 1,600 people need to drink 20g alcohol a day for a year, in which case we would expect 16 instead of 15 problems between them. That’s 7.3 kg a year each, equivalent to around 32 bottles of gin per person. So a total of 50,000 bottles of gin among these 1,600 people is associated with one extra health problem. Which still indicates a very low level of harm in drinkers drinking just more than the UK guidelines. This analysis supports the current UK guidelines as being low-risk, but perhaps would better be described as ‘very low-risk’. Is this an argument for abstention? The paper argues that their conclusions should lead public health bodies “to consider recommendations for abstention”. But claiming there is no ‘safe’ level does not seem an argument for abstention. There is no safe level of driving, but government do not recommend that people avoid driving. Come to think of it, there is no safe level of living, but nobody would recommend abstention. Presumably people who choose to drink alcohol moderately get some pleasure from it, and any risk needs to be traded off against this enjoyment. When it comes to policy recommendations, it is notable that the authors recommend public health measures to reduce total consumption at a population level, such as “excise taxes on alcohol, controlling the physical availability of alcohol and the hours of sale, and controlling alcohol advertising”. There is no mention of information campaigns or targeting heavy drinkers, which may be less effective ways of reducing average consumption. Why are these results completely different from the last major Lancet paper on alcohol? In April the Lancet published a major paper on alcohol by Wood and colleagues. The figure below is from the Supplementary appendix (it was not featured in the main paper). 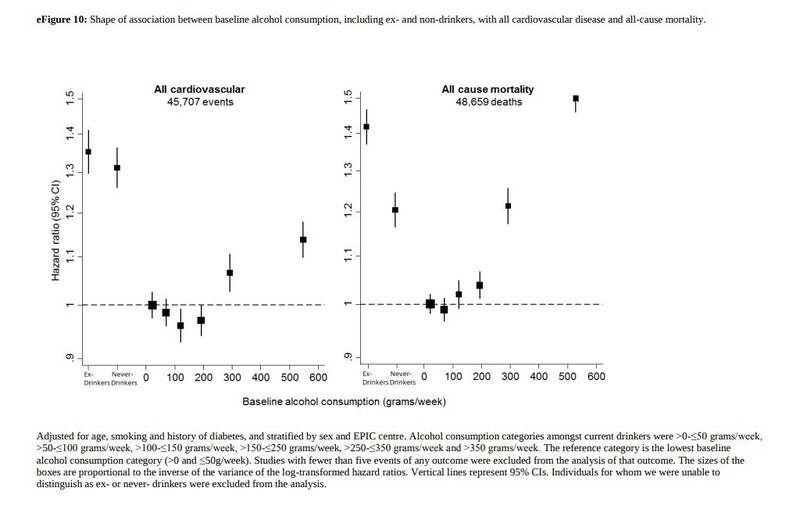 eFigure 10 from Wood et al, showing that, compared to moderate drinkers, ‘never-drinkers’ experience 30% more heart disease and strokes, and 20% higher overall death rate. But this does not mean that this is because they don’t drink. This showed clear harms to non-drinkers, even when ex-drinkers are excluded, in direct contrast to the IHME paper. How could they come to such different conclusions? Some of this may be due to the data and modelling. Wood uses the raw data on 600,000 individuals, while IHME reled on published reports. Wood reports outcomes in consumption groups with limited statistical modelling, while IHME build a complex (and rather opaque) model that estimates a smooth relative risk curve. But the major difference is in the outcome measure. Wood uses all-cause mortality and all cardiovascular events, while IHME build a separate ‘dose-response curve’ for each of 23 outcomes which they identify as having a causal connection with alcohol. If these specific outcomes are chosen, then there is little harm associated with being a non-drinker, whereas simply looking at all-cause mortality shows a dramatically higher risk in non-drinkers. This suggests some of those who choose not to drink are just different, and not because they are ex-drinkers, or in ways that are taken into account by statistical adjustment for possible confounders, or in terms of the 23 alcohol-related outcomes. Think of the people you know who habitually avoid alcohol. There may be many reasons for their choice, but for some it may just be because it does not agree with them. Perhaps some constitutional feature helps people to enjoy the effects of drinking alcohol within moderation, which also tends to confer a slightly longer life. Maybe choosing to avoid alcohol is not so much a cause of ill-health as, at least for some, a sign of potential ill-health.